an interesting relation between a notion of trace for lax group representations and various known phenomena all somehow related to equivariant string theory are established. While I won’t do justice to the title of this entry, I do want to record a neat relation between these three items which I recently came across while browsing some literature. Update: See the update at the end of this entry. •\bullet propagation in nn-dimensional QFT. We describe basic notions of nn-transport theory, such as trivialization, transition and trace and discuss examples. Update: Robert has written something about this meeting. I won’t. 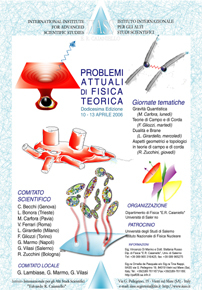 This year’s conference in the annual series Problemi Attuali di Fisica Teorica will be held April 7 - April 13 in Vietri, Italy (like last year). In the context of an ESI program on Gerbes, Groupoids and Quantum Field Theory there will be a workshop in Vienna from May 9 to May 13 2006. Official application deadline was a couple of days ago, but one can still apply. Here is a question about adjunctions. While I am struggling to understand elliptic cohomolohy, David Corfield, over on his weblog, has taken a look at the literature from the perspective of a philosopher of real mathematics. “Real” here is meant in the sense of “what active mathematicians are really concerned with”, as opposed to an eternal occupation with Russel’s paradox and Gödel’s incompleteness. Have a look at his book for more. Transcript of part 3 of our first session. Transcript of part 2 of our first session. Here is a transcript of part 1 of our first session. As noted already elsewhere in the blogosphere (by P.P. Cook and by P. Woit) there are currently a couple of acticles concerned with math and physics blogging. In his article Exploring the Blogosphere, Craig Laughton, who runs the blog Gooseania says, to my mind, some very true things about the benefits of blogging. I use this opportunity to remind the (potential) readers of any of these blogs once again that the way to read blogs without becoming insane is to use an RSS reader software. The latest Mozialla Thunderbird has one built in. with the honest intent to write something about this. But one main concept used in this work is a notion of loop space of an orbifold, expressed in groupoid language as the loop groupoid, and it turned out that I had my own ideas on this object. Thinking about this interfered with my intent to read the rest of the paper. So in order to get this out of the way first I here present instead some observations on an alternative perspective on the loop groupoid. I’ll try to report on more recent developments concerning loop spaces of orbiolds (loop orbifolds, actually) in a seperate entry.